At window cleaning wakefield/leeds we offer numerous ways to pay for our service. When we come to clean your windows we will knock on the door and take payment by cash. This is our preferred method. If you are not in we will put a card through your letter box informing you we have cleaned your windows. You then have the option of posting us a cheque or paying online via Paypal, Go Cardless or Bank Transfer. Cash on the day of the clean is our preferred method of payment on the day and is often the easiest for ourselves and the customer. Almost as good and preferred by many is the GO Carless online payment system, basically follow the link, sign up and complete a direct debit form, you can make a one off payment or even easier setup a 4 weekly or 8 weekly payment (depending on your service schedule and price) to have the money debited from your account each time a clean is carried out, simple. To send a one off payment direct from your account please email call for our bank details. How often should we have our windows cleaned? 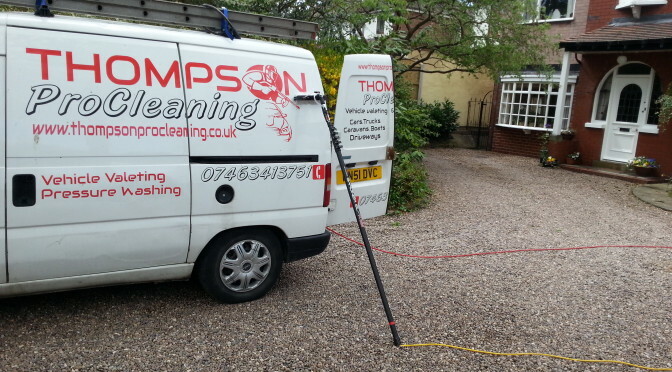 Here at thompson window cleaning wakefield we recommend you have your windows cleaned every 8 weeks. In our experience this is the optimum frequency in terms of keeping your window cleane all year round as well as getting the best value for money. We find having offered 4,6 and 12 weekly cleans in the past that 8 weekly is the preferred option of our customers. However if you live in a high traffic area or otherwise would like your windows cleaning more regular the standard 4 weekly option is available.